Siri is making new friends with celebrity status. 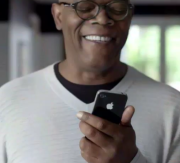 Apple started airing two new TV ads featuring actors Samuel L. Jackson and Zooey Deschanel and Siri, the voice-controlled personal assistant on the iPhone 4S. The ads show the two actors using Siri to manage their daily lives, from searching for restaurants and markets to creating appointments, setting reminders and playing music. Apple’s use of celebrity endorsements for its ads is a departure from the company’s previous commercials, which were focused on the iPhone itself, highlighting one of its features or apps. Apple also had two ads promoting Siri, including one featuring Santa in December. But at the same time, it’s worth noting that Apple is using celebrity endorsement for one of its beta products. Yes, Siri has been in beta since the iPhone 4S launched last year, and it still has the beta tag on Apple’s website. The ad featuring Samuel L. Jackson, who has played bad guys and action heroes, shows the actor in the comfort of his own home, cooking in preparation for a date night. He uses Siri to help him covert units for cooking, cancel an appointment, search for a market and set reminders for his food. Zooey Deschanel is shown in the other ad wearing pajamas and quirkily asking Siri if it’s raining outside. She also looks to find a restaurant that delivers soup and then plays a tune to cheer her up. You can just notice at the end of the ads a note saying that sequences have been shortened, which is Apple’s disclaimer to the Hollywood sparkle of the ad, with Siri responding to questions almost instantly. However, two lawsuits were filed against Apple last month over Siri, accusing the company of overselling Siri’s abilities in ads. AT&T, Sprint and Verizon branding appears at the end of the ads, which judging by the lack of a carrier name on the iPhone shown in the videos, were made by Apple and their advertising agency TBWA\Chiat\Day. Apple has not posted the ads on its official channels yet, but viewers have recorded them.